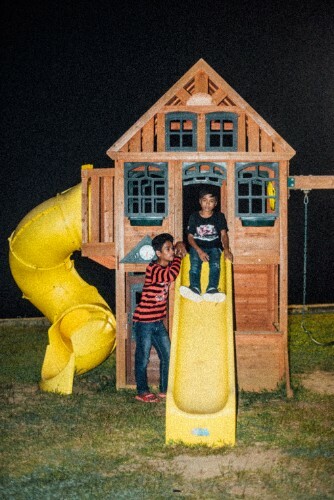 It was already dark when two brothers arrive at a tightly secured compound in Basilan tucked in between a marsh and a forest. As they make their way into the garden table where we are sitting, we can sense a hint of reluctance. They take their time before settling, occasionally exchanging looks between each other, sometimes a tense laugh. When they were finally introduced to us, we get a clear glimpse of their faces. Patrick was a little over five feet with a slender frame and dark complexion. We were told he was 25 years old, but it would be hard to confirm this just by looking at him. He could pass for someone younger. Junjun, who’s 10 years old, had the usual demeanor of a playful child, sometimes tapping on the table rhythmically or fiddling with the can of juice served before him with a wide grin he couldn’t hide. His eyes were commanding as much as they were charming. In Filipino, we use the word mapungay to describe eyes like his, which were bright, down-turned, and accentuated by thick curly lashes. A local joined us to translate Filipino to Yakan and back before we started asking questions about how they got there and how they’re feeling, careful not to seem too eager or intimidating. Their answers were curt. The translator himself was having a hard time trying to relay the message to the boys, as we were told some words don’t have an equivalent in their native tongue. As their responses get lengthier, signaling the slow transition out of their shells, that’s when we inquired about their personal lives, the ones they led before becoming members of the Islamic separatist organization Abu Sayyaf Group (ASG). “Where do you live?” we ask. “Bacung,” Patrick says. It is a barangay in the municipality of Sumisip, Basilan. They tell us they come from a family of seven kids, five if you discount the eldest who died during a recent military encounter as a member of the rebel group, and the youngest who passed away. Asked on how their childhood was, Patrick simply says, “Wala na [kaming] nanay at tatay.” He was just 15 when their parents were killed. Their father who was then a civilian augment in the military was alleged by their rival family to be a member of ASG, making him a target in an operation where he was eventually killed, along with his spouse. After losing their parents, both of them were adopted by kin, who they suspected was behind the death of their parents while the rest of their siblings lived with other relatives. It was then that their eldest brother joined the ASG. 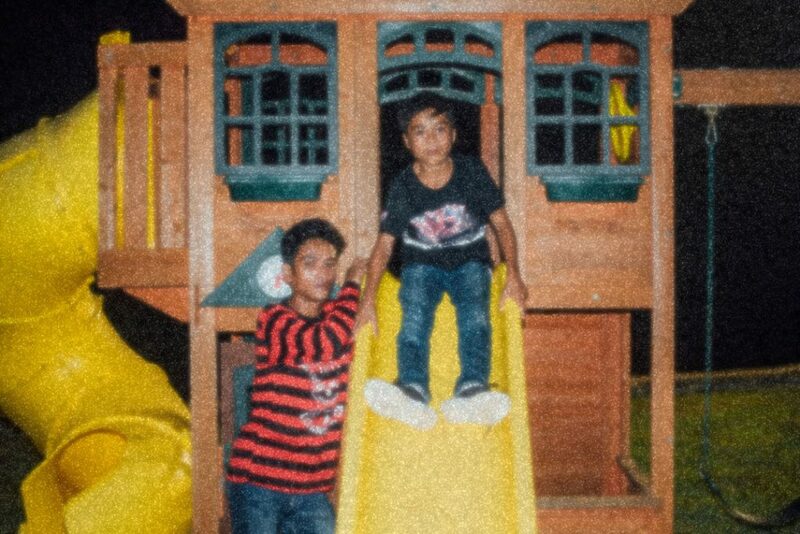 Patrick and Junjun eventually ran away from their foster family and lived on their own, working at a rubber farm where the ASG frequently passes by. Lured with the promise of a P5,000 monthly salary and revenge for the demise of their parents, Patrick caved in and joined the group. According to a United Nations report, armed groups such as Bangsamoro Islamic Freedom Fighters, New People’s Army, and the Maute Group are known to use minors as human shields during encounters with the military. ASG, on the other hand, is also notorious for luring in economically-vulnerable folks, apart from minors. In an interview with Inquirer.net, a local community leader in Cotabato City said that most minors are recruited through social media. But that wasn’t the case with Patrick and Junjun. What drove them to join ASG was the promise of a better life, somewhere away from the dark one that they had led after their parents died. And it felt mostly like that in the first few days, says the 10-year old Junjun. They were fed humble but sufficient meals albeit sleeping in makeshift beds made out of tarpaulin. It was also in the camp where Junjun met friends and playmates, though Patrick says he didn’t even have time to play due to their circumstance. “So what did they make you do in the camp?” we ask the siblings. They say they were taught Arabic and made to read the Quran for days on end when they first arrived. When it came to topics like plotting attacks, Patrick says they were kept out of such talks, which were deemed as sensitive information. Were they asked to hold guns and participate in gunfights? “Sometimes.” But whether they have killed someone in doing so, they can’t remember. It took an incident where Junjun was wounded by cannonball shrapnel—one in his head and another in his buttocks—to convince them to walk out of the camp. Responders say that Patrick was carrying an Armalite rifle, while Junjun a carbine rifle with a wooden stock when they turned in themselves to the town mayor. Under the rehabilitation program called Program Against Violent Extremism (PAVE) for Peace led by the then Autonomous Region of Muslim Mindanao government with the Armed Forces of the Philippines, surrenderees like Patrick and Junjun are reformed to be productive members of society. According to data from the Office of the Regional Governor of ARMM and the Office of the Cabinet Secretary, the majority of 186 former ASG members under PAVE are males aged 30 and below. “The program works within the 3R framework or Return, Reform, Reintegrate,” says former Regional Cabinet Secretary John Louie Balagot. Through PAVE, returnees can approach the military, police, or local government units to inform them of their intent to surrender and to hand over their firearms. The reformation process begins with profiling the returnee through interviews to determine their background, the factors that contributed to their decision to join ASG, and the reasons why they surrendered. “They are also subjected to a series of psychosocial activities wherein they are given the opportunity for self-reflection and self-reevaluation,” explains Balagot. The final stage in the PAVE program is reintegration where surrenderees are provided facilities to live normal lives in the community that they choose to settle down in with their families. They are provided with housing, livelihood, access to education through the Alternative Learning System, and other government services. But it’s not always a seamless transition. Balagot tells us that surrenderees still face threats from active ASG members who feel they’ve betrayed the organization, civilians whom they have rido (clan feuds) with and those who were victims of their terrorist activities, including local politicians. As for Patrick and Junjun, the threat is real but they don’t consider it much of a hindrance. What they do now is avoiding all possible contact without having to hide. A month before we met them, a government official flew them to Manila to watch the Basilan Steel basketball team play at the Maharlika Pilipinas Basketball League. Junjun who was one of the delegates says he thoroughly enjoyed watching the game but not so much being in Manila. He says he would still prefer to live in Basilan. Patrick shares the same sentiment, although he says he would love to move to Isabela City rather than go back to their hometown in Bacung. He got married last year and is now a father. His wife is a 23-year-old distant relative.